Success! I have finally managed a sandwich that Sunnie is excited about and asks for! I’m not a huge sandwich person, but I do have moments where nothing else will do. I’ve had a tougher time converting Sunnie to the simple joys of sandwiches. Short of putting together a kimchi and bap (rice) sandwich (hmm, might have to think about that ;P), she’d always been rather lukewarm on sandwiches. 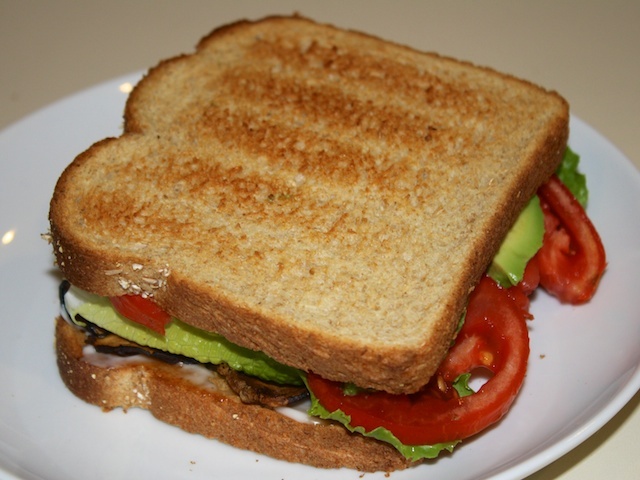 However, I think I finally got it right with this one – the classic BLT plus avocado. For some reason, BLT’s must appeal to the Asian palette as they have always been my mom’s favorite sandwich as well. This recipe is very easy and really hits the spot. We’ve been eating it all fall! Soak dried shitake mushrooms in warm water for 30 minutes (you can also use fresh, just bake approximately twice as long). 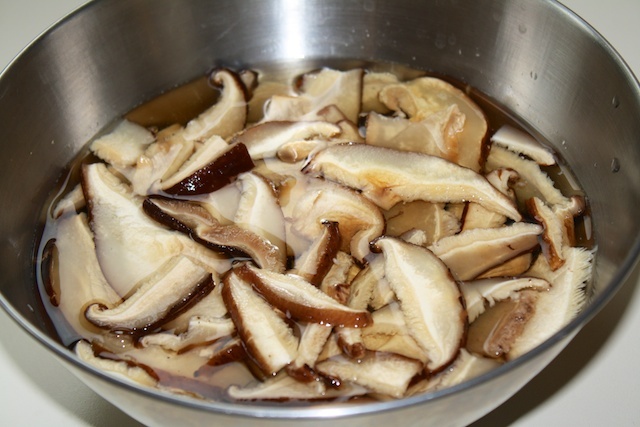 Using your hands, squeeze the water out of the soaked mushrooms. In a bowl, drizzle olive oil over the mushrooms, add salt and pepper to taste, and mix thoroughly to coat. 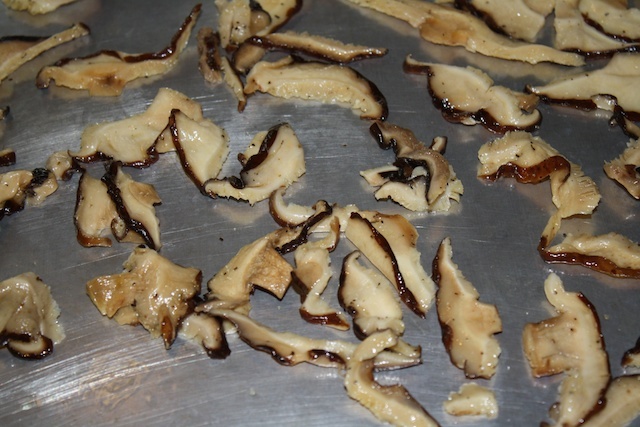 Spread mushrooms out on a baking sheet and bake for 20-35 minutes,checking occasionally, until crispy. If you are using regular tomatoes, remove seeds by slicing tomato in half horizontally and using your finger to push out seed pockets. 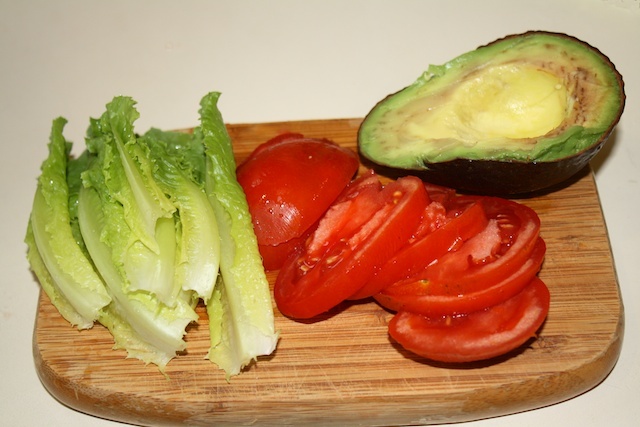 Slice tomato and avocado (cut in half vertically, twist to separate, and then slice inside the shell, using a spoon or knife to remove slices). Toast your bread, spread mayo on, and assemble! 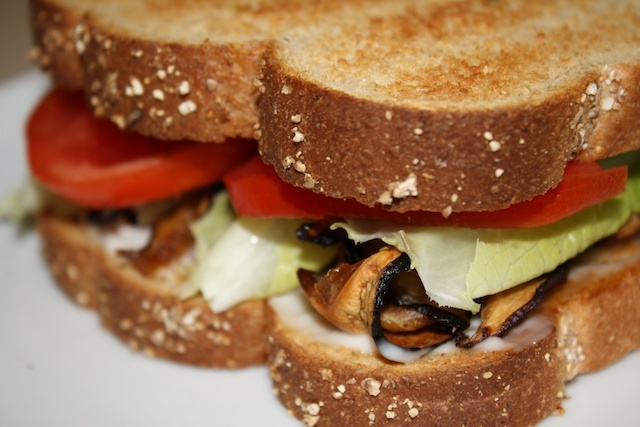 These sandwiches go great with a side of vegan mac and cheese, or a bowl of soup for a fantastic lunch & the recipe is easily doubled. 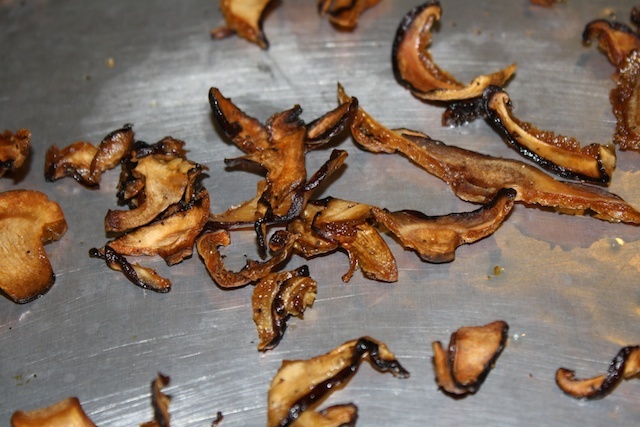 Soak the dried shitake mushrooms in warm or hot water for at least half an hour to soften them. We like to used dried, sliced shitake mushrooms because of their convenience (we always have a bag in the pantry for making japchae). 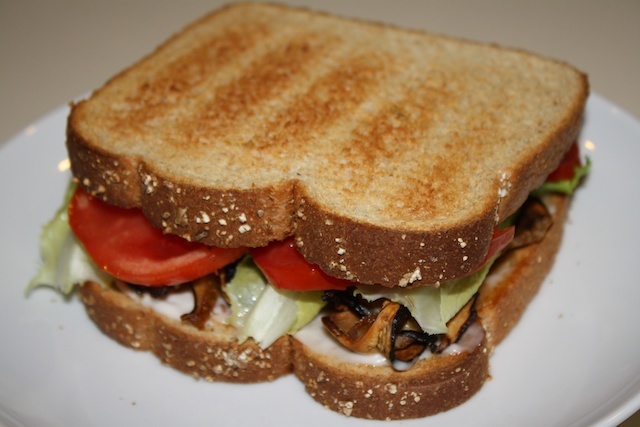 Depending on how much “bacon” you like on your sandwich, you can go with 1-2 cups of dried mushrooms. Keep in mind that they will shrink down when roasting. I usually go with 1 heaping cup; but you can always munch on any that are leftover if you make more -yum! You could also used dried whole mushrooms and just slice them after soaking or use fresh – you’ll just have to bake longer. Make sure the mushrooms are not still tough and soak longer if necessary. 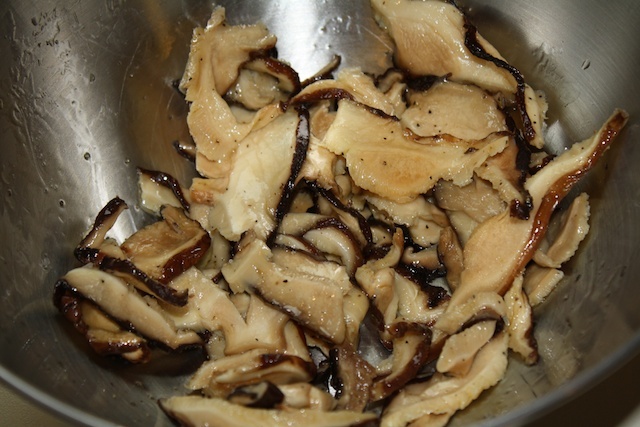 Make sure to squeeze the water out of the rehydrated mushrooms really well, and then mix with olive oil, salt, and pepper. Spread the mushrooms out on a baking sheet at bake in a preheated oven at 350 degrees for about half an hour, until crispy, being sure to check on them every couple of minutes after about 20 minutes. Keep in mind that you want the “bacon” to be crispy. They should be cooked long enough to crunch when you bite into them. We like to use roma tomatoes, but regular tomatoes work just fine too if you remove the seeds. We also like romaine lettuce because it is so crisp, but any lettuce will do. Slicing your avocado vertically in the shell is an easy way to get nice slices that you can remove with a knife or spoon. 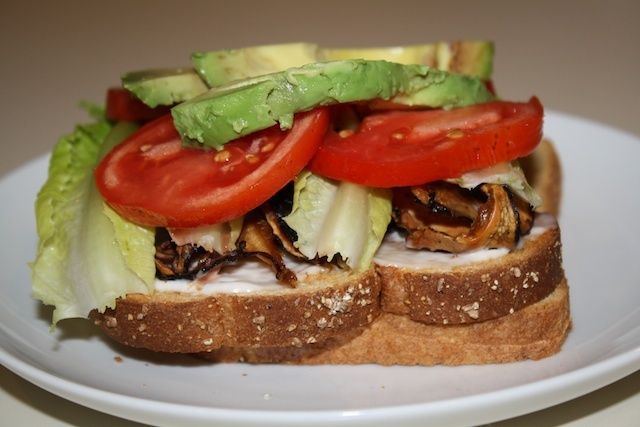 Assemble everything on your toasted, vegan bread and you’re ready to go! Any vegan mayonnaise will do, but our favorite is definite original vegannaise. I think you’ll love the shitake mushroom bacon. So convenient and so yummy! Give it a try! That looks great! 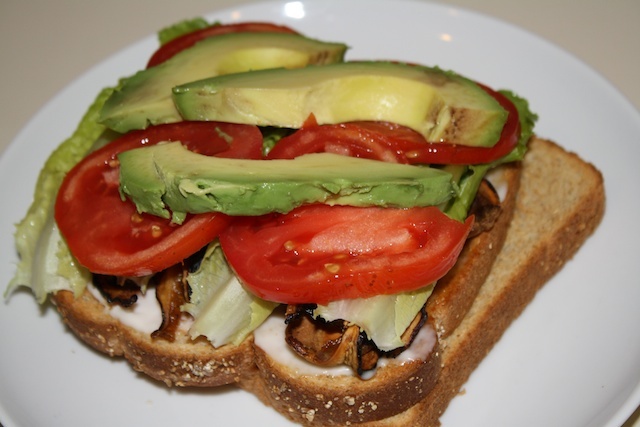 I am also kind of on and off with sandwiches, but anything involving avocado and tomato is a good thing. The shitake mushroom bacon is a creative idea. Thanks for visiting, Samantha. I hope you’ll give it a try! Mmmm, I don’t think I’ll even miss the bacon! This is sumptuous. I love mushrooms and I take them as an alternative for meat. I want to try this for myself. Hopefully, I can follow your directions right. Hope you enjoy it! Let me know if you run into any questions! Wow, the shiitake bacon strikes me as genius. (As I think I’ve made abundantly clear) I don’t like mushrooms, but roasting them would seem to be a great way of changing their texture to something I would like. I wonder if you could add some natural smoke flavor (a couple of drops) to the soaking water, or maybe to the oil, to make it even more flavorful. What do you think, Chef Bill? Hi, Lu! I’m not sure about the smoke flavor as I’m not sure when it would be best to add it. You squeeze most of the water, so I’m not sure how much would remain if you added it to the soaking water. But I also don’t know if it would be absorbed at all if you add it to the oil! I think I would probably pick the oil though between the two. If you give it a try let me know how it turns out! I have been avoiding mushrooms as they need to be cooked, I guess now I have reason to – looking at your lovely recipe. Thanks for sharing! PS. I might add a little “Hot smokey barbecue marinade/ sauce”. Mark & Spencer sells a vegan version that should compliment the mushroom bacon! Hi, KB! Thanks for visiting. Hope you give it a try. Unfortunately, we don’t have any Mark & Spencers in the US, but that’s an interesting suggestion. We’ll have to find something similar and give it a try! Hi Bill, thanks for putting up such a lovely site, it’s inspiring for me – I am just getting the hang of substituting milk with soya milk in my coffee and not quite a vegan! I think friends in the US have mentioned Frank’s redhot sauce which might be as good if not better. But I’m not sure it’s vegan friendly. Indeed, it is vegan-friendly. We use it in our buffalo tofu recipe. I might encourage cashew cream for coffee if you’re not crazy about the soy. It takes a little more work (soaking for a number of hours, blending with some water til fine, and then straining), but is much creamier, and my vegan friend who takes cream in his coffee (I do not) really prefers it to the soy. Good luck in your vegan journey and thanks so much for taking it! It’s funny, Lu, after I posted this, Sunnie told me that there are actually rice and kimchi sandwiches in Korea. They use a bulgogi burger with kimchi, and use packed, sticky rice for a bun! Thanks for the link. If you were willing to go the less healthy version, I’ve also found some pretty convincing vegan ham in various asian grocery stores’ freezer section that might work. I know Koreans really like simple ssams (wraps) so we often will just have rice and kimchi with ssamjjang in a lettuce leaf, or just wrap rice in seasoned kim. Likewise, the next recipe I’ll be posting is what I call bachelor bap, which is a super simple rice, kim, and what the linked recipe calls furikake, bibimbap that I’m addicted to. Ohh, I’ll look forward to bachelor bap! I also remembered that triangle kimbap is supposed to be pretty common. It’s intriguing because of the way it’s folded up. I’ve never had it, though it would be fun to make. Rice and seasoned kim is delicious and addictive–something about the salty kim and warm rice, yum. Awesome! Thanks for letting us know how it turned out! Put the two words “extra” + “ordinary” together. That is what this shitake bacon is. Served mine with avocado, roasted red pepper and homemade quinoa bread. Fabulous. So much better than coconut bacon and this is coming from a girl who loves here baco’s. Going to add the minimal leftovers to my endive soup. Thank you for trying and thank you for sharing! Fantastic, so glad you liked it! I haven’t tried the coconut bacon thing yet, but I do like this. Roasted red pepper sounds like an awesome addition. Thanks for letting us know how it turned out! So glad you enjoyed it, Ellen! Thanks for letting us know how it turned out and for linking to us!